Anyone who knew Joey, knew Stripey Kitten. Anyone who knew Stripey Kitten, knew that she was Joey's constant companion. 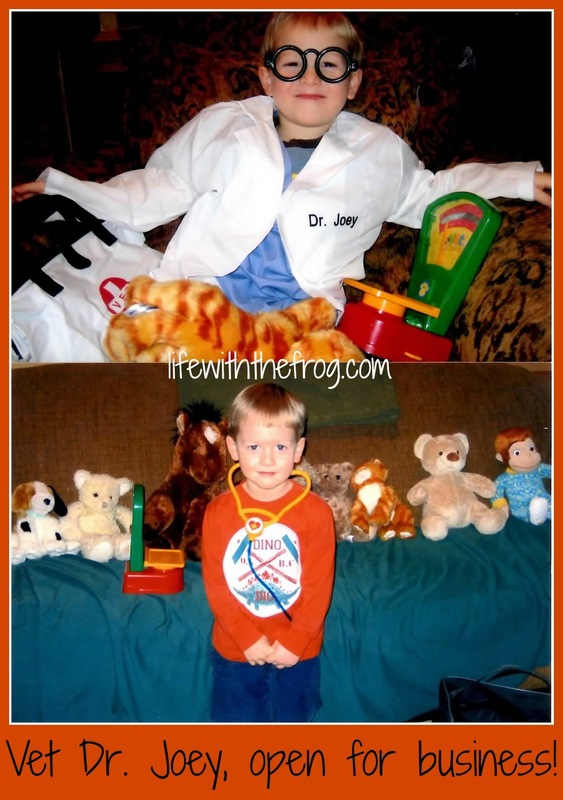 From the Christmas Joey received a play veterinarian kit that came with a fluffy orange cat, to his half-hearted journey to kindergarten, until the days leading up to his death, Stripey Kitten was there. Joey had perfected this nasally Stripey Kitten voice, which he used for when Stripey was talking to us. Joey learned how to do all sorts of tricks with Stripey Kitten, including how to balance her on his head. Stripey Kitten acquired her own wardrobe that included shiny pink boxer shorts, leopard-print boxer shorts, months-of-the-year sweaters, several blinged-out collars, and one very appropriate devil costume for Halloween. We have too many Stripey Kitten stories to count. Someday Stripey will have her own book. She has become the living (so-to-speak), tangible symbol of Joey's love and spirit. She hangs around as a reminder of the wonderful love and imagination that Joey possessed. One day last week, it was Lil' C's turn to bring Show and Tell to his kindergarten class, the same room that Joey (and Stripey Kitten) was in. "Can I bring Stripey Kitten for Show and Tell?" Oh my heart. It caught a bit on that branch that Lil' C clings to when trying to remember Joey. "You want to show Stripey Kitten to your friends?" I was hesitant. What if something happened to Stripey Kitten? What if she got damaged in some way? Honestly? That cat has to last until I die. I want to cuddle her on MY death bed. "Yes," Lil' C answered excitedly. "I want to show her to my friends so they can know all about Joey." "That's not a good idea, Buddy," Hubby chimed in. He knows how protective I am of that cat. But I disagreed. After all, Stripey Kitten IS tangible Joey to him, since Lil' C doesn't remember much about Joey. "I will ask your teacher what time Show and Tell is, and I will bring Stripey Kitten to your class, okay?" Show and Tell ended up being first thing in the morning; so I let Lil' C carry Stripey in, while Edgie and I waited in the school lobby to take her home. After a few minutes of waiting, we saw the teacher assistant walk by. She was crying. "Did you see Stripey Kitten?" I asked. "I haven't seen her since Joey was here. It was such a surprise." There were memories in her eyes and her sad smile. Soon enough, Lil' C came walking out with Stripey Kitten. "What did everyone think?" I asked. "What did you say about her?" "Mom, I don't know. I have to go back to class." I said, "Good-bye, I love you, have a great day" to his back as he walked away, and put Stripey Kitten in my purse. I saw Nurse B walk in the school doors. 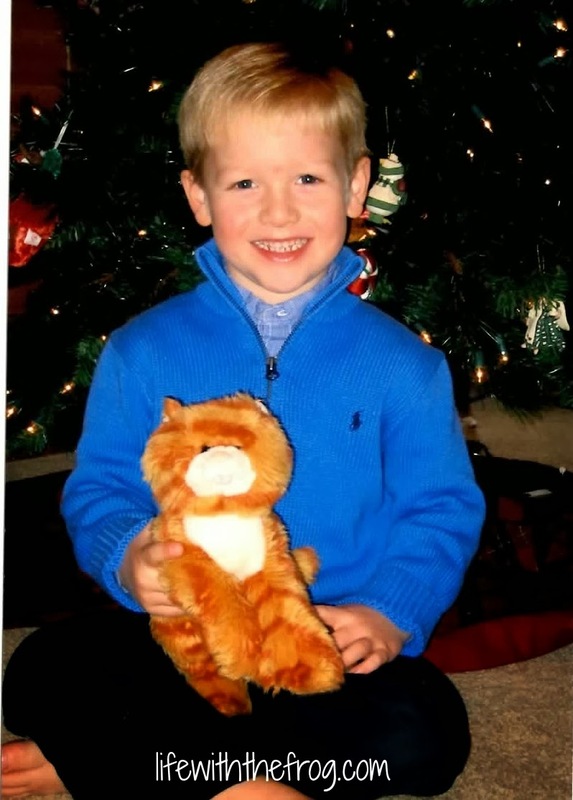 Joey and Stripey Kitten spent a lot of time in her office during his time as a kindergartener. I knew she'd want to see Stripey. "I have someone who wants to see you," I said to her as I pulled the considerably less fluffy cat out of my purse. Her eyes immediately welled with tears as she went to touch Stripey Kitten and give me a hug. I think I even saw the office staff dab a few of their own tears. Later I asked Mrs. G, the kindergarten teacher, what Lil' C had said about Stripey Kitten to the class. Evidently he had said that Stripey Kitten was Joey's favorite stuffed animal. He needed some prompting to say who Joey was and what had happened to Joey. He said he didn't remember much about Joey, except that he was a really good brother. And when one of his classmates asked where we kept Stripey Kitten, Lil' C said that we keep her on Mommy's bed or dresser or night stand. It's true, I like to keep a good eye on her; and Slim and I often steal her off each other's beds. In all of the sadness and anxiety I have had about moving and losing memories of Joey, I guess I had forgotten that we have one big tangible piece of who Joey was symbolized in this little, floppy, matted, worn, stuffed animal: Stripey Kitten.